My first view of the NOAA ship Thomas Jefferson. This morning I came aboard the Thomas Jefferson via small boat transfer from the pilot station dock in Lewes, Delaware. 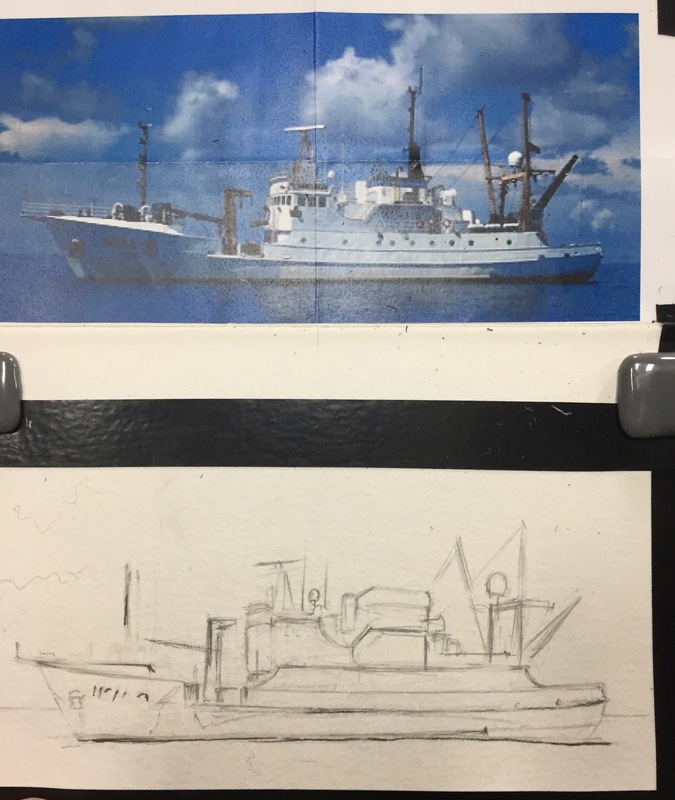 Since coming on board, I have been welcomed by so many people, toured the ship, had a safety training, cautiously drove the small boat around the Delaware Bay, and tried to learn some background about hydrographic surveys. That is quite a lot of new things to process in only 5 hours! 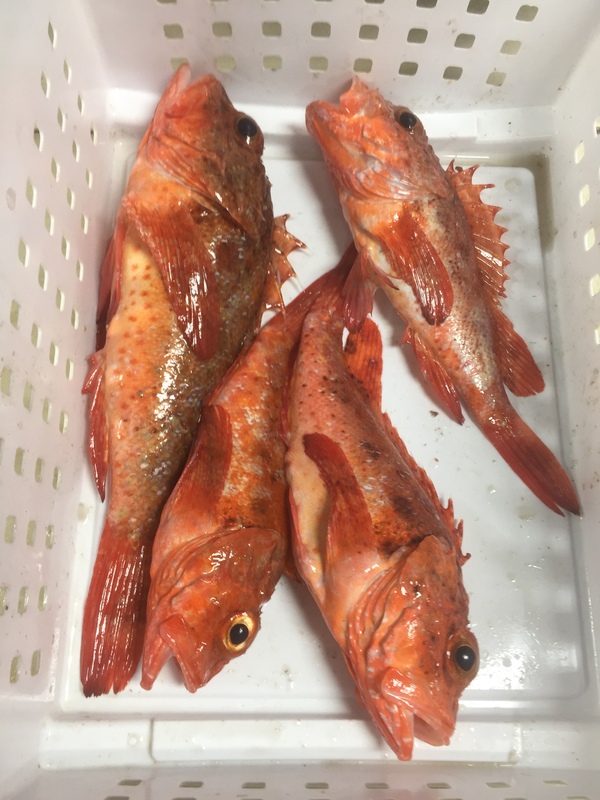 The major purpose of hydrography is to create a thorough imaging of the ocean floor, particularly to warn mariners of any obstructions or shallows. There is evidence that nautical charts showing depth have been in use since as early as the sixth century BCE, and can easily be created through the use of a lead weight and a string. 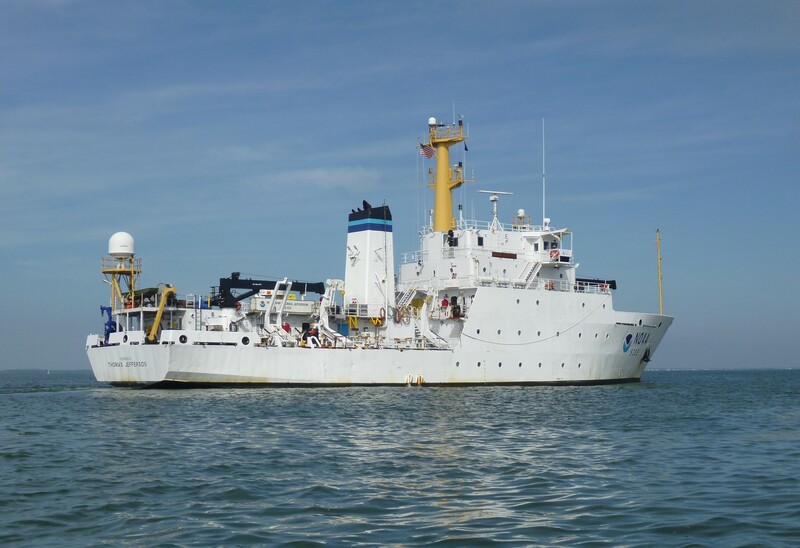 These days, NOAA ships have much more high tech ways of surveying the ocean floor. 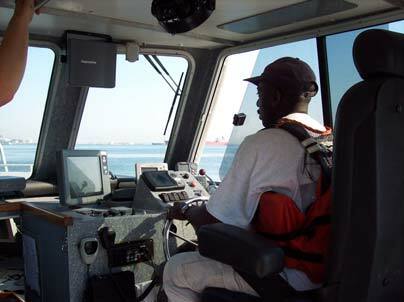 The Thomas Jefferson spends most of its time at sea charting waterways and coastlines to ensure safe travels for both private and commercial mariners to be able to navigate safely. 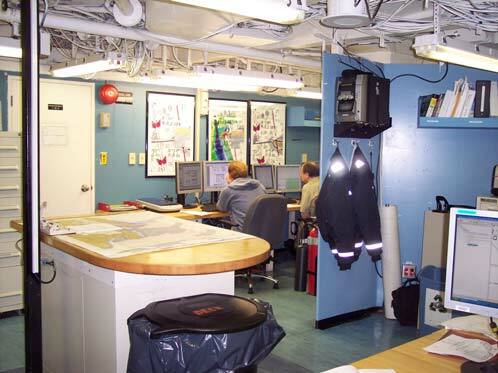 Priorities in a nautical charting mission are based on factors including: waterway usage rates, stakeholder requests, rates of change to the sea floor (both natural and anthropogenic), and age of the chart’s source. For example, a waterway to a port used by oil tankers would be very important to survey because the result of a tanker running headlong into an obstruction would be disastrous. After Hurricane Sandy hit the East Coast in October 2012, the Thomas Jefferson was assigned to survey the sea floor of New York City’s harbor in case of any new obstructions that might have been blown in undetected. No other ship was allowed to sail through the harbor until the Coast Guard received the new charts. 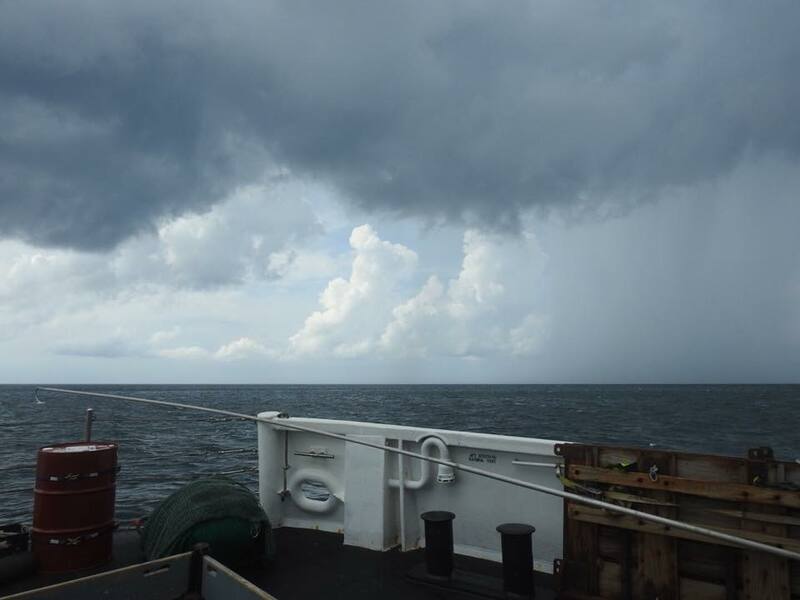 So far this summer, the Thomas Jefferson has already spent countless hours surveying the area around Long Island Sound and the Delaware Bay. 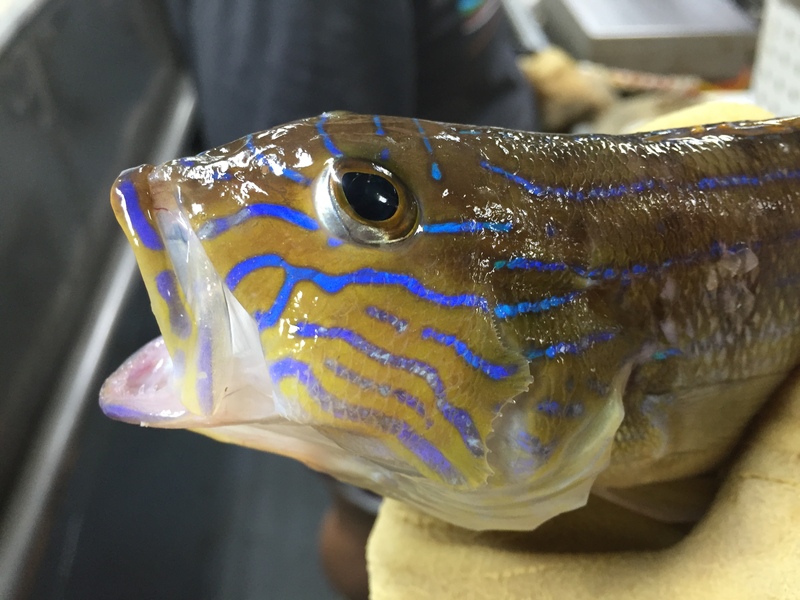 To have a better grasp of the major scientific research that occurs on a hydrographic research vessel, I spent a portion of the afternoon speaking with Ensign Andrew Clos. 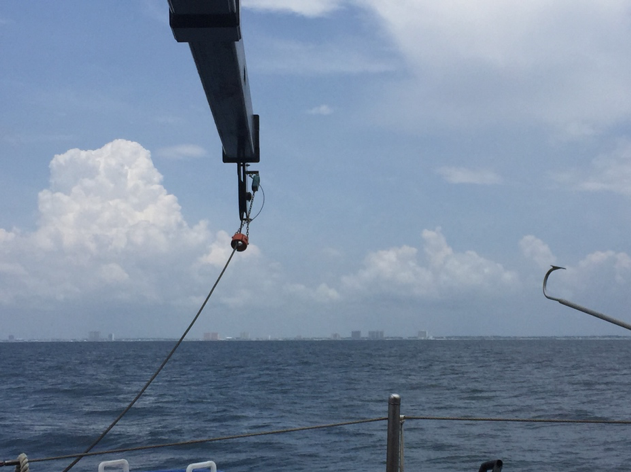 Ensign Clos mentioned that the two most important tools for data collection are the side scan sonar (SSS) and the multi-beam echo sounder (MBES). These two tools work through the use of sound waves to collect both 2D and 3D data. The SSS and the MBES send sound waves which are reflected back to the ship and transformed into images analyzed by the scientists on board. 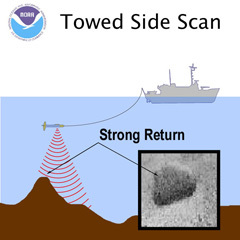 The side scan sonar is towed by the ship in very carefully spaced horizontal lines to gather the initial data about the existence of any objects in the water. An acoustic image is created and analyzed for anything out of the ordinary, in which case the MBES is launched for further investigation. 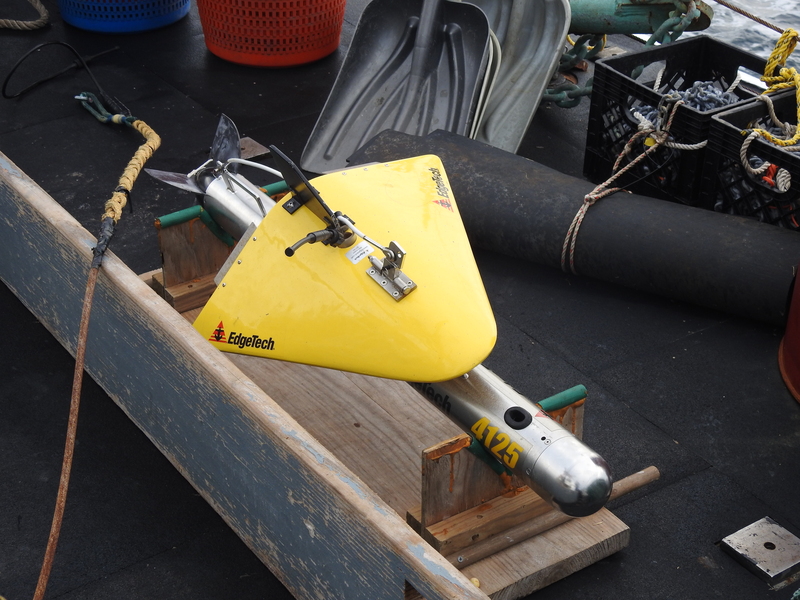 The MBES is hull-mounted to the ship and survey launches, and lets out sound waves in a 128° cone which much more accurately determines the depth and position of the object. 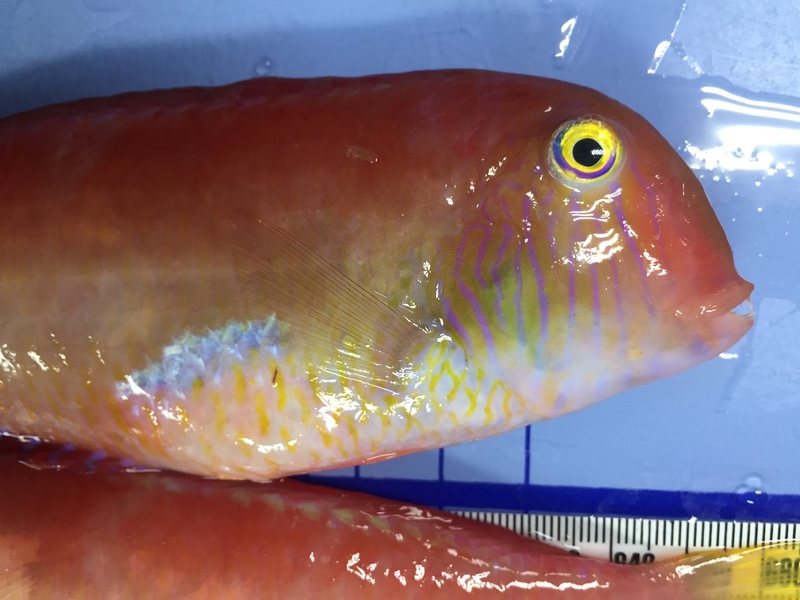 The MBES can collect millions of data points in a day, which is converted into three-dimensional images. 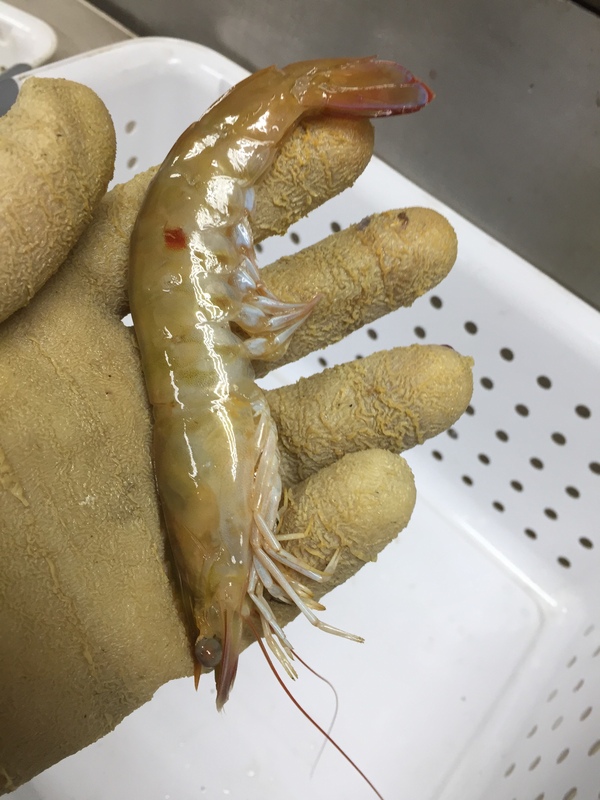 The scientists aboard spend many hours sifting through the data, and correcting the data for differences in depth based on tidal flows and water data. Sound waves travel through water at approximately 1500 meters/second (m/s), much faster than the 340 m/s in air. 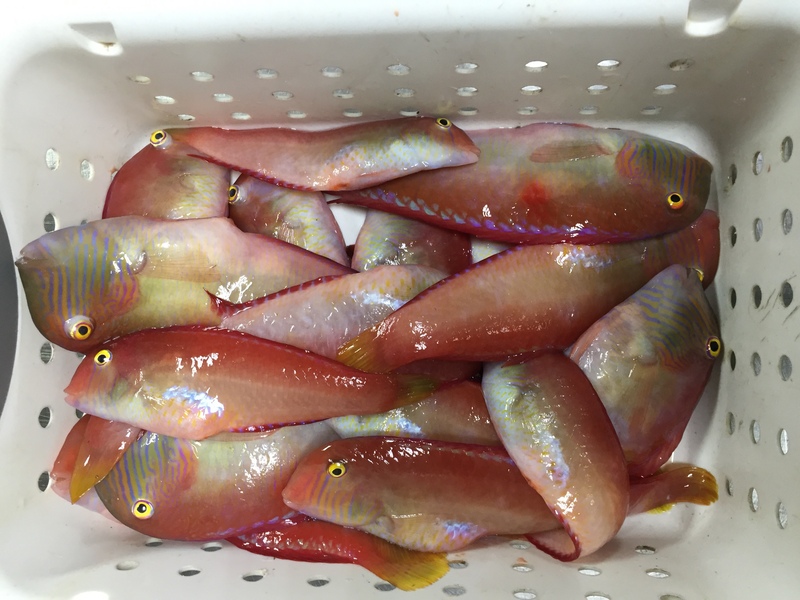 However, differences in salinity and temperature can impact the accuracy of measurements. All of the branches of NOAA must work together to piece together the puzzle of the ocean floor. Hanging out at the beach the day before getting aboard the TJ. This has been quite a busy week for me, which has culminated in this spectacular adventure. Monday was our last day of final exams, and today I feel like that was a lifetime ago! 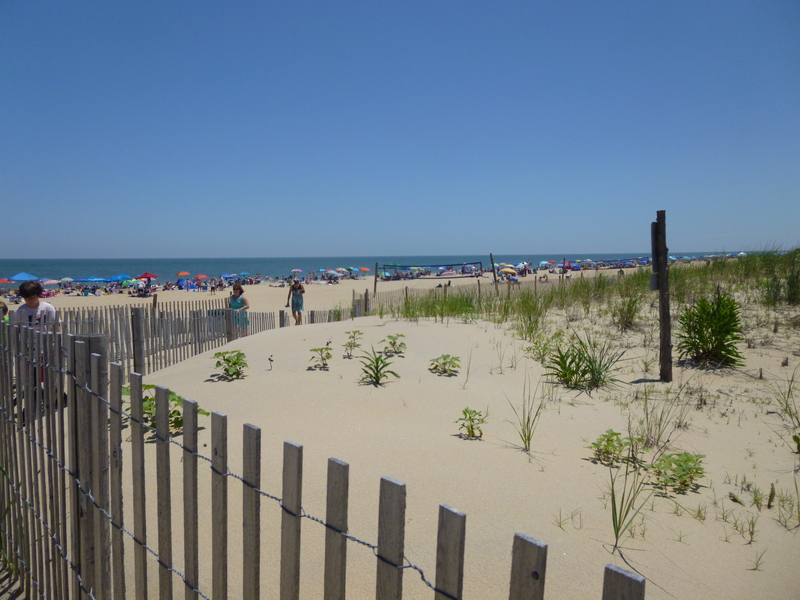 I spent most of yesterday morning driving to Delaware, and was rewarded with spending the afternoon relaxing on Rehoboth Beach. As it turns out, relaxing is on the table for tomorrow, too. The TJ is waiting on a repair to the MBES, and will need to stay anchored close to port for at least one more day. Commander Krepp has allowed some of the members of the crew to arrange for a day out paddling and kayaking around the beach. 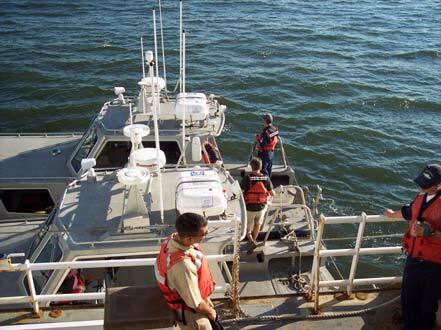 Still, there is work to be done and safety to consider aboard a NOAA vessel, so even that excursion has to be carefully managed into two shifts. 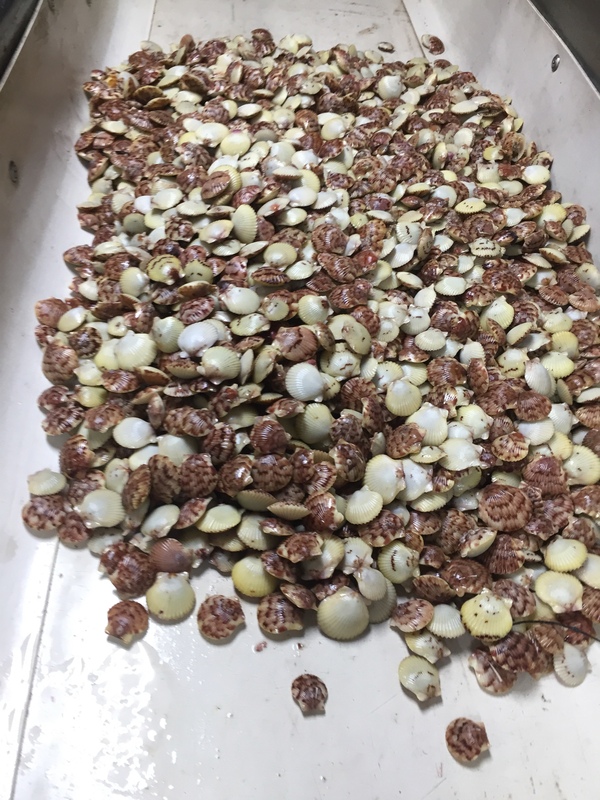 Fossil remains of horseshoe crabs have been found spanning approximately the last 450 million years. 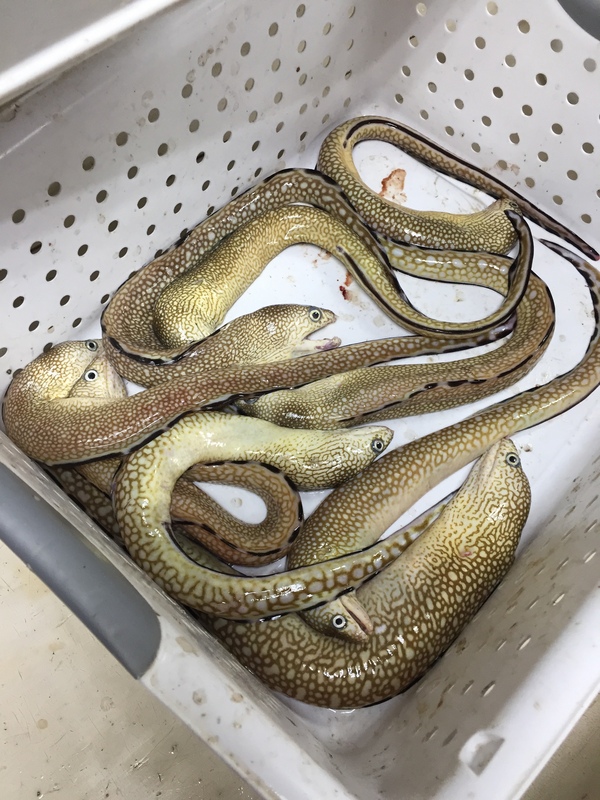 They are called living fossils because they are some of the rare species that have survived extinction with little genetic diversity. 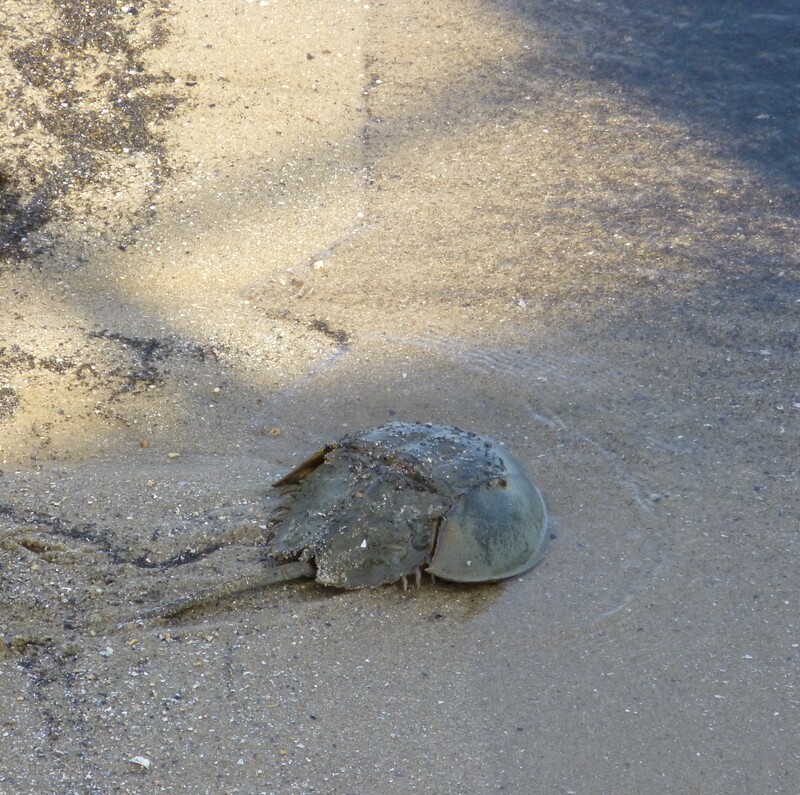 The horseshoe crab is a living fossil found on Delaware’s shores. Chuck’s stateroom aboard the ship. 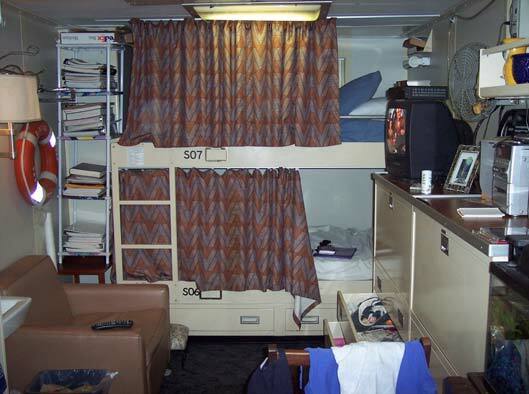 During his voyage, Chuck (bottom bunk) shared his stateroom with Ensign Andrew Ostapenko (top bunk). After Andy used the shower it was my turn. I’ve used smaller showers, but not much smaller. The water pressure was good, and the temperature comfortable. I am now awake! I quickly dressed and went to the Mess Hall to catch up on some eating. I met the CO, and a few other crew. I also met Tom who is from the NOAA office in Silver Springs, Maryland (near DC). 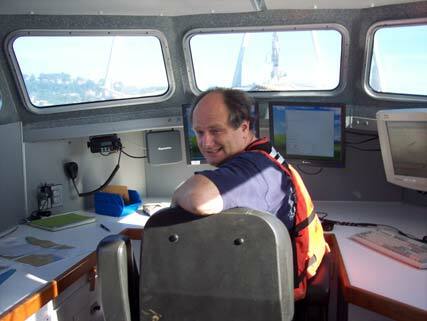 He is on board to observe and get a better idea what the ships do to gather the data. Breakfast was simple (I am trying to lose about 10 lbs.) – cereal, fruit and coffee – and I was off to take a few pictures before we headed out to sea. The morning sky is clear and the day will be hot, so it’s probably a good thing we are going to be on the water. Next to us on the pier a group of visitors was getting the tour of the USS INTREPID. Manhattan and the surrounding area was enshroud in a gray haze. It’s going to be a learning day and I have a lot to learn. For now, I think it’s time for me to stop writing and take my Dramamine. Tides for Sandy Hook Low @ 0258h (-0.2 ft.) & 1459h (0.2 ft.); High @ 0855h (5.0 ft.) & 2105h (5.6 ft.) Currents in Sandy Hook Channel Flood: 0604h (2.0 kts.) & 1814h (2.3 kts. ); Ebb: 1212h (1.6 kts.) & 0041h (1.7 kts.) 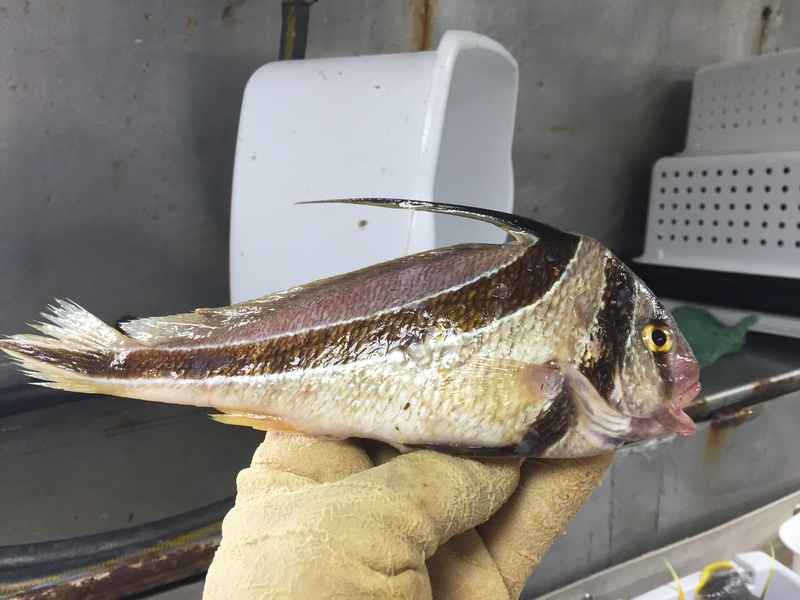 Weather from Sandy Hook to Fire Island AM: W winds 10-15 kts., seas 2-3 ft.; PM: NW winds 10 kts., seas 2 ft.
“When sound waves from the SSS Fish are reflected off an object a dark or “hard” return is created in the data. The object blocks the sound waves from traveling beyond it, which creates a “light colored shadow”. At 1730h I met with Peter the hydrosurvey data technician and observed him downloading today’s data. Peter applied a series of corrections (heave, tide and sound velocity) to the data. This time consuming process took about two hours. 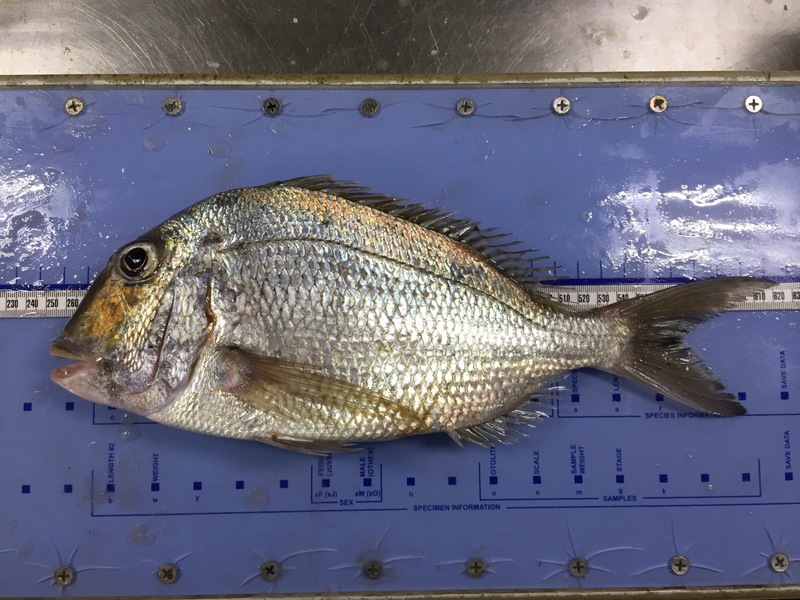 This data will be sent to NOAA’s Atlantic Hydrographic Branch (AHB) where it will be reviewed, checked, cross checked, and additional data will be added if needed (e.g., from Army Corp). The raw data is also sent to the National Geographic Data Center in Boulder, CO where it is archived. From AHB the data is sent to NOAA’s Chart Division where it is made into the navigation charts we commonly use. FOO and Acting XO Chris informed me I will be going on one of the launches tomorrow. #3102 with SSS Fish and Multibeam (MBES). I can’t wait. I’m going to need a good night’s sleep as we’ll be on the launch for about 10 hours! Good night!! Candice Autry prepares to use the CTD instrument which collects water information related to conductivity, temperature, and depth. Today I had the opportunity to go out on the Fast Rescue Boat (FRB) to use the conductivity, temperature, depth (CTD) instrument in various places in the harbor. The CTD looks like a simple white tube; however, the capabilities of the CTD are far from simple! This devise provides essential data for scientists. Three of us boarded the small FRB, loaded the CTD, and were off to our locations. The first observation noted is that being on the fast rescue boat is a different boating experience compared to the launches and the THOMAS JEFFERSON. The “fast” part of the description is fitting; the boat moves quickly! The main function of the CTD is to collect data about how the conductivity and temperature of water changes relative to depth. 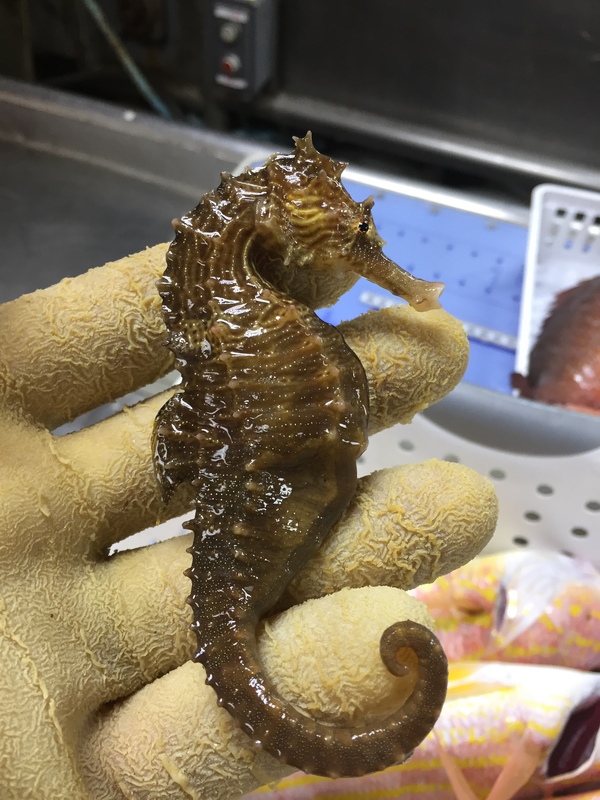 Conductivity and temperature information is important because the concentration of the salt of the seawater can be determined by these two changing variables. 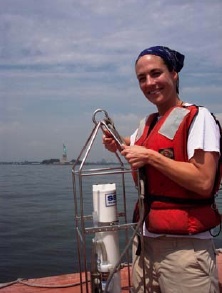 Candice Autry holds the CTD instrument. We collected information from three locations; once in the morning and then again in the afternoon. 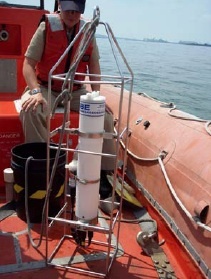 The CTD devise can also help surveyors determine the speed of sound in the water. 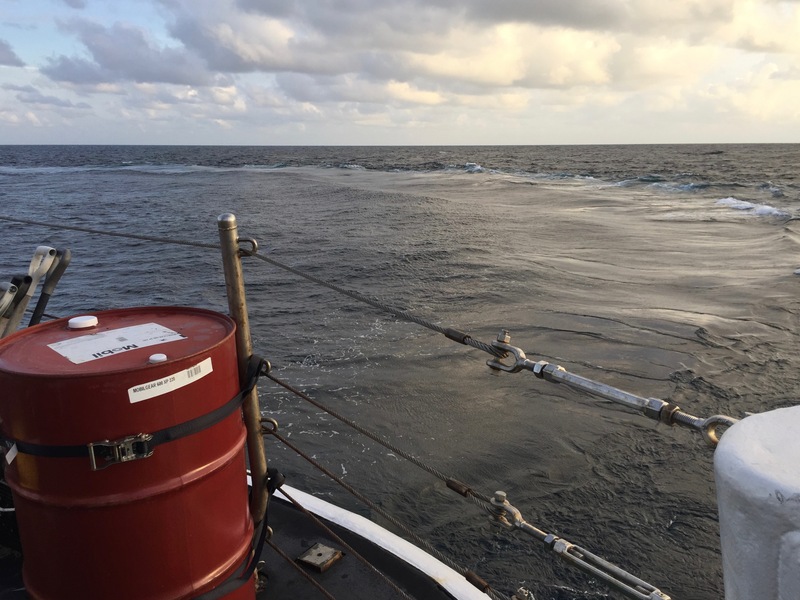 The information from the CTD is used in conjunction with multi-beam sonar providing accurate data about the depths of obstructions on the seafloor. The metal frame seen in the picture on the outside of the mechanism is called a rosette. 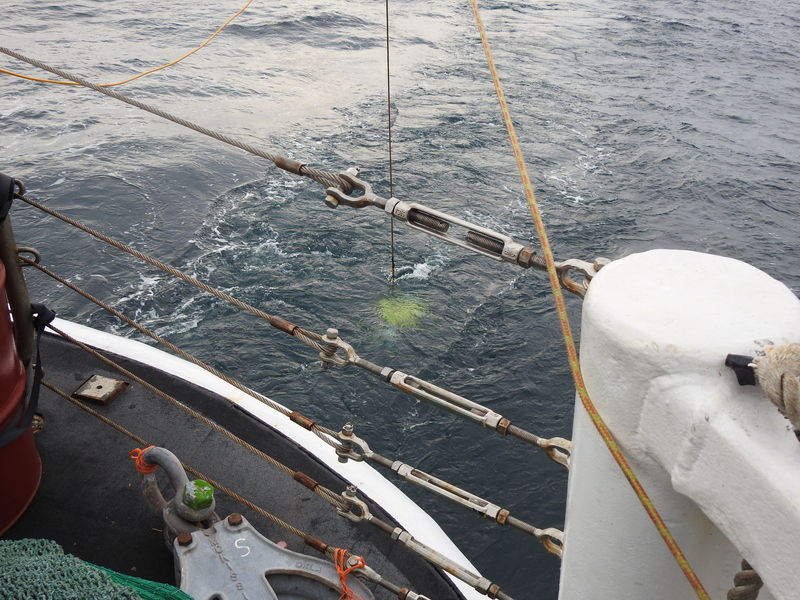 We attached a rope to the rosette of the CTD, turned it on to collect data, held the devise in the water for two minutes for adjustment, then lowered the instrument down to the bottom of the seafloor. 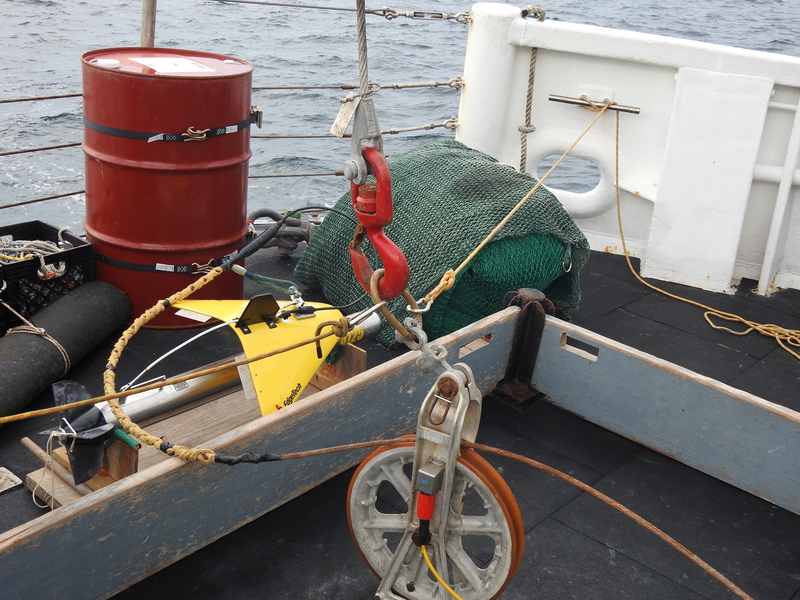 Once the CTD hits the bottom of the seafloor, the rope is pulled back up, the devise is put back into the fast rescue boat, turned off, and it is off to the next location to collect data. 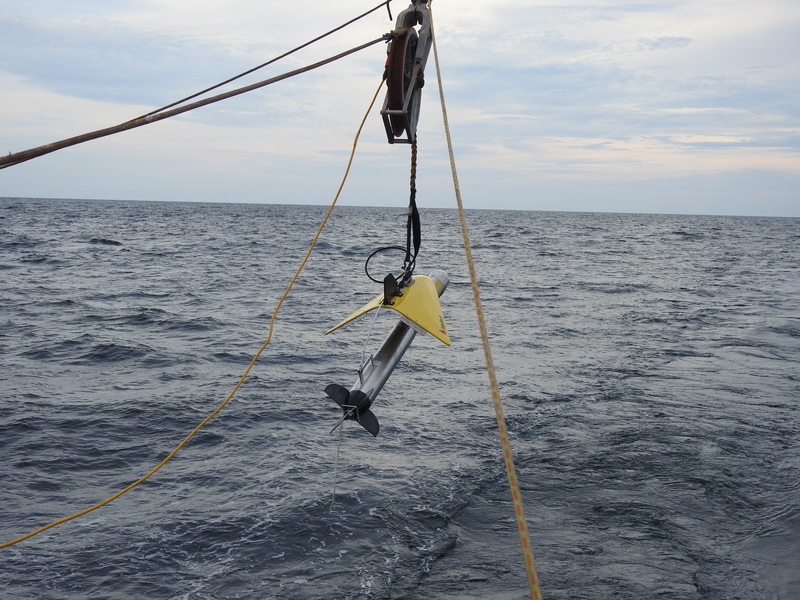 We deployed the CTD in three different locations in the morning and three different locations in the afternoon. At each place where data collection occurred, the location was recorded by using a global positioning system. 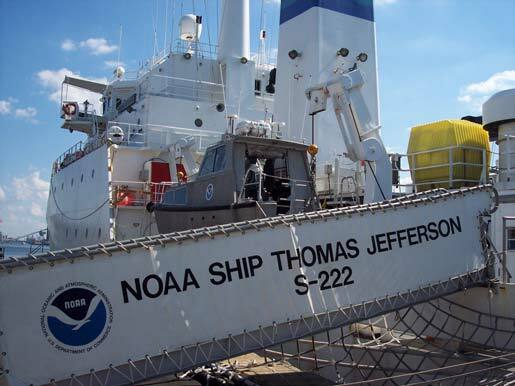 Back on the THOMAS JEFFERSON, the information that the CTD collected is downloaded to a computer where specialized software is used to understand the data. All of the experiences on the THOMAS JEFFERSON have been interesting and fun. Tomorrow I will be helping some of the crew on the deck of the ship. 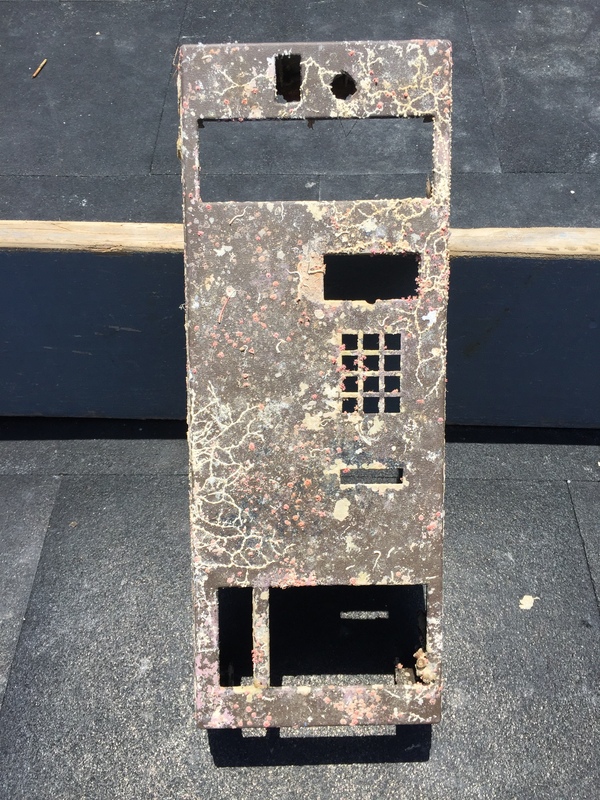 Exposure to saltwater often causes rust to occur; a ship requires constant maintenance! I am also realizing that this adventure will be over soon, with less than two days left. Until tomorrow…..
A closer view of the CTD. 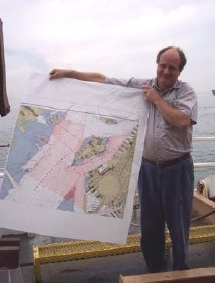 Surveyor Peter Lewit shares the chart used to collect data. The red lines in the white area represent the paths the launches took. Science and Technology Log: Data Collection Begins! We have made it to our destination after a thirty-hour journey. 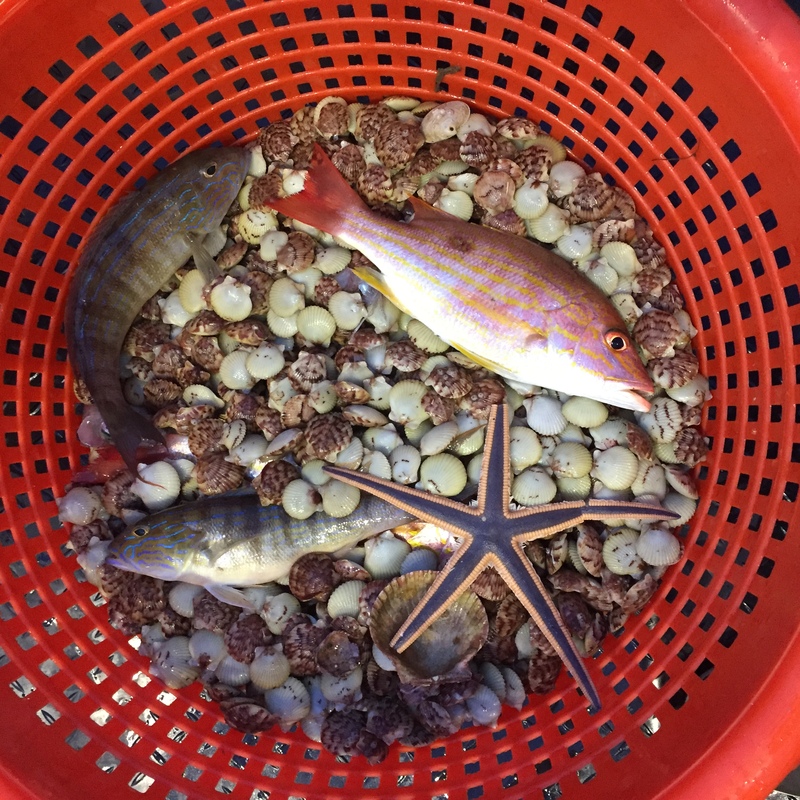 It is exciting to get started with data collection, I am curious what is on the bottom of a busy harbor. After a brief safety meeting that kicks off the morning, we prepare to go out on the launches to begin the process of making a chart that will provide information about obstructions in navigable waters. The teamwork of the crew of the THOMAS JEFFERSON is inspiring to watch, each with a specific duty communicating and working together so that launches are safely deployed. 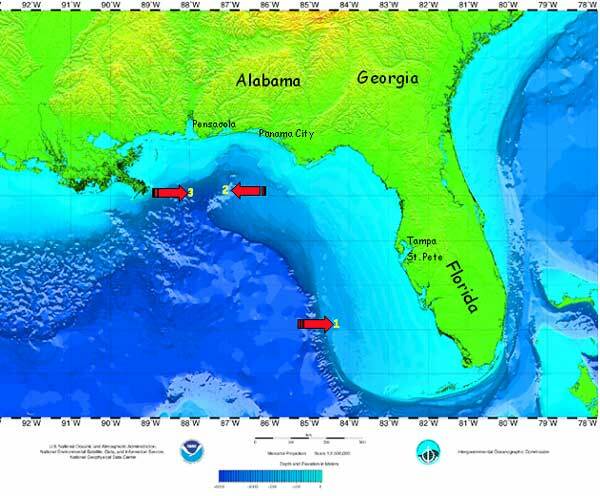 Today two launches will collect data using side-scan sonar and multi-beam sonar technologies. The launch is ready to collect data. Typically, a launch has a driver, a person to look out for water traffic, and a surveyor who observes the data being collected and manipulates the computers connected to the “fish” below the launch. Bernard Pooser driving the launch in the harbor. The route is very specific and he must follow careful ‘driving lines’ that the surveyor also sees on one of the four computer screens inside of the launch. This job is much easier said than done! Senior Surveyor Peter Lewit prepares to collect side scan sonar data, which provides light and dark high-resolution images of obstructions on the seafloor. 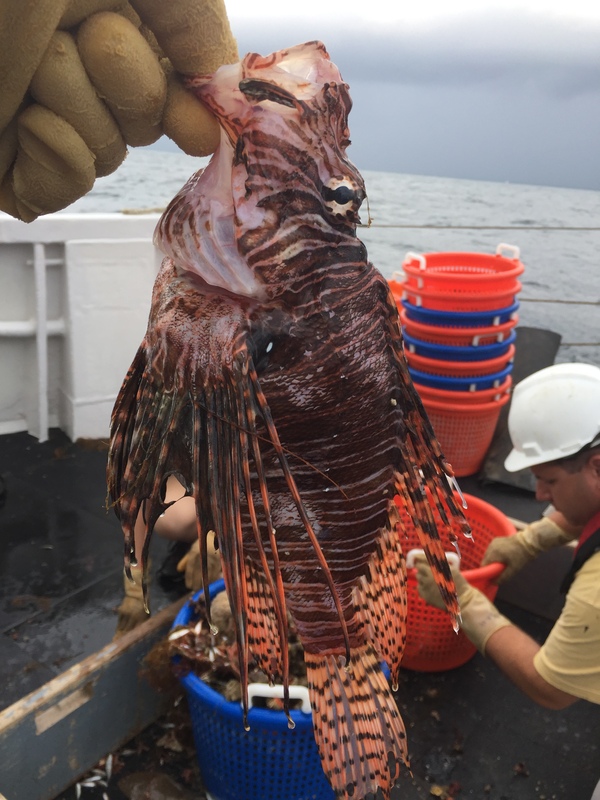 The launch I am on today utilizes side-scan sonar, which incorporates sound navigation and ranging that is used for searching for objects on the seafloor. 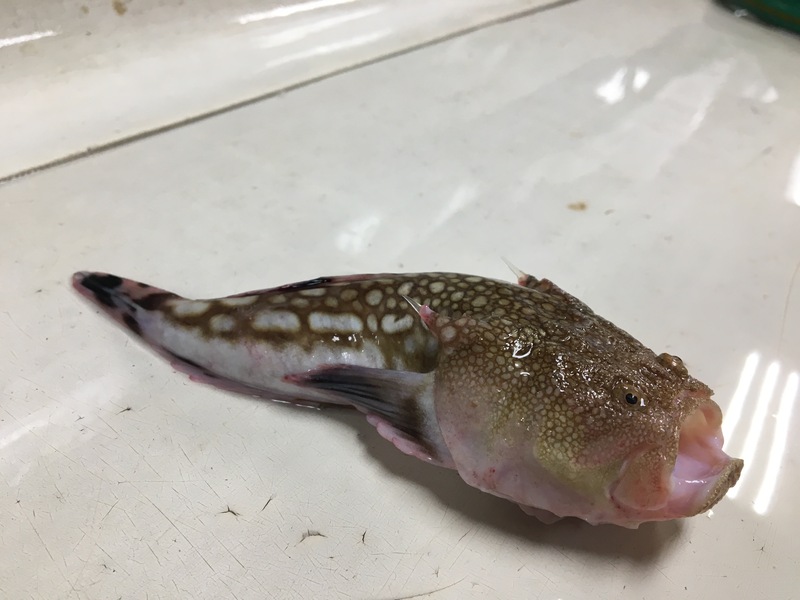 This technology transmits sound energy, which sends a beam from the “fish” (the instrument underneath the launch) that bounces off the seafloor and other objects. Once the sound energy hits the floor, it then bounces back to the fish in the form of an echo. These beams are sent in a fan-shaped pattern that sweeps the seafloor from underneath the launch to approximately 75 meters from either side of the boat (although distances can reach 100 meters). The strength of the echo is recorded as a “picture” that can be seen on a computer screen. 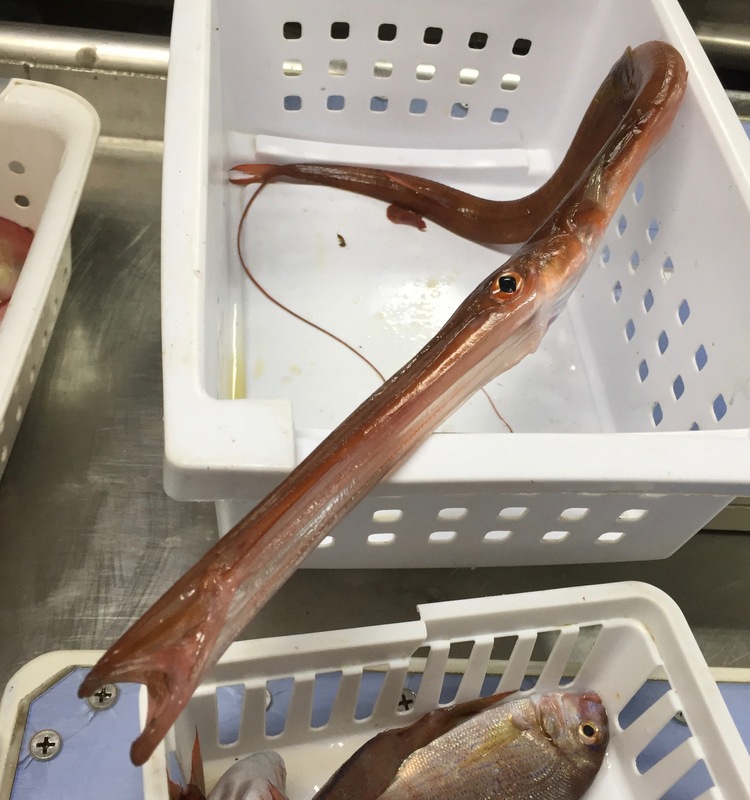 If there is an object on the bottom of the seafloor, such as a protrusion, the return signal will be strong and will create a dark image on the screen. If the return signal has a weak return, then the image on the computer will look light. A tire on the seafloor, or a barge that has sunk is easily seen and depicted! These images are fascinating. 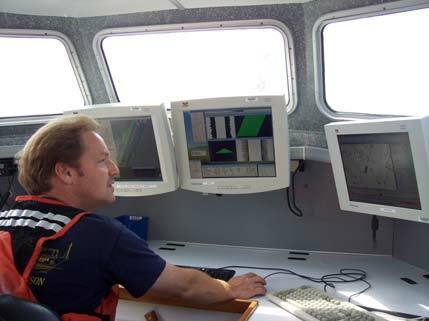 Surveyor Doug Wood observes computers where data is being collected. 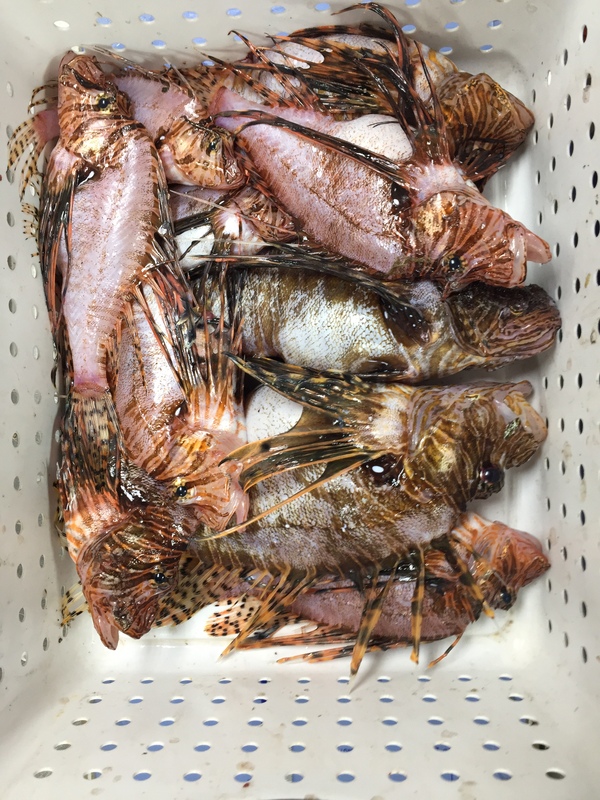 The benefit of side-scan sonar allows for high-resolution of what is on the seafloor. The only drawback of side-scan sonar technology is that the depth of these obstructions cannot be ascertained. Determining the depth of an obstruction is where multi-beam sonar is applied. 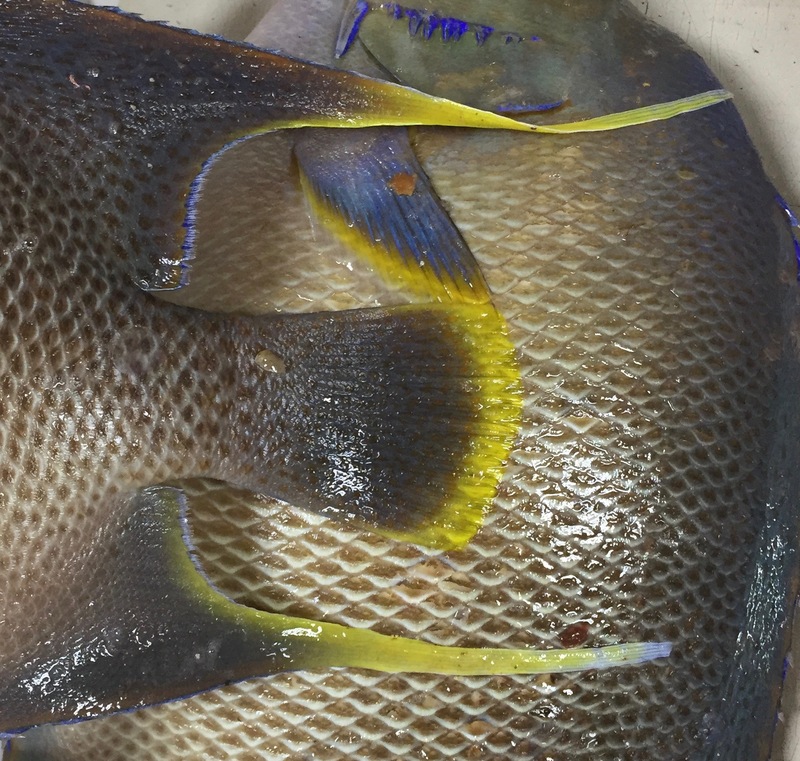 Multi-beam sonar utilizes fan-shaped sonar that records depths. This is done by recording the time it takes for the acoustic signal to travel from the receiver to the seafloor (or object on the seafloor) back to the receiver. The receiver is often referred to as a transducer. The multi-beam sonar transducer is attached underneath the launch. The combination of side scan sonar and multi-beam sonar create for specific data that can be shared so that navigable waters are safe. I must admit I was a bit nervous about being seasick! Our thirty-hour journey was difficult for me for only about three hours, right at the beginning of the trip. I am very happy for a short experience with seasickness! After getting my sea legs, it is interesting to realize that one can adapt quickly. Often I felt like I was being rocked to sleep as we made our way to our destination through the waves of the ocean. After being on a ship for a couple of days, experiencing land is an interesting sensation. I missed moving around on water and felt as if I were on water even though I was on land! I do not really miss being on land at all. 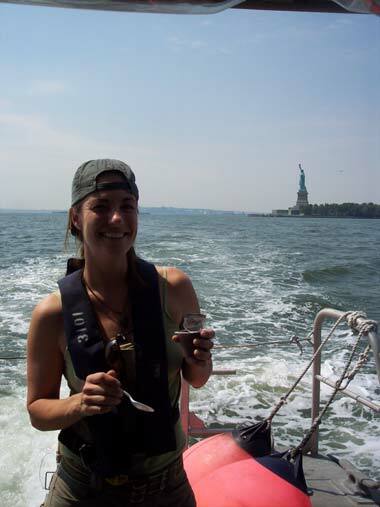 Candice Autry, enjoys pudding while taking a break from observing data collection. The Statue of Liberty is in the background! 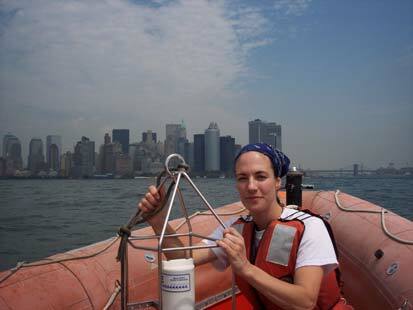 Hello, greetings from Teacher at Sea Candice Autry. I teach science to middle school students at a wonderful school called Sheridan School in Washington, DC. I have been given the great opportunity to sail with the crew on the NOAA Ship THOMAS JEFFERSON. Our cruise has been delayed several days due to unforeseen problems with some of the complex and necessary equipment on the ship. It is important to be flexible with any kind of change, so these past few days have given me the opportunity to explore the ship as we wait for final repairs. 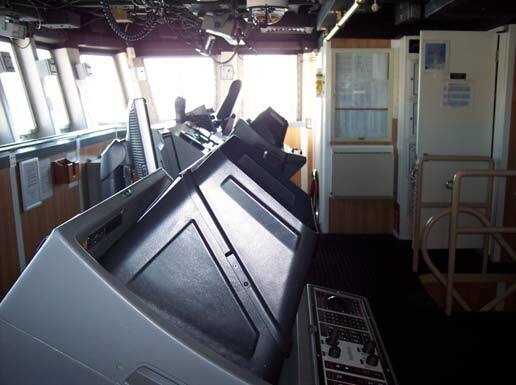 The objectives of this particular ship primarily involve hydrographic surveys. 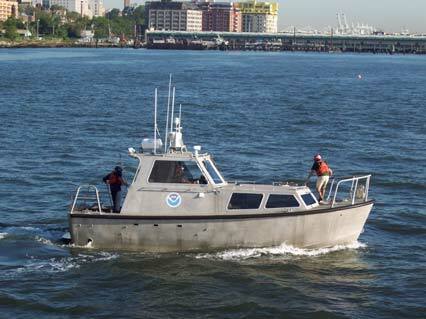 Hydrography is the science that has to do with measuring and describing physical characteristics of bodies of water and the shore areas close to land. 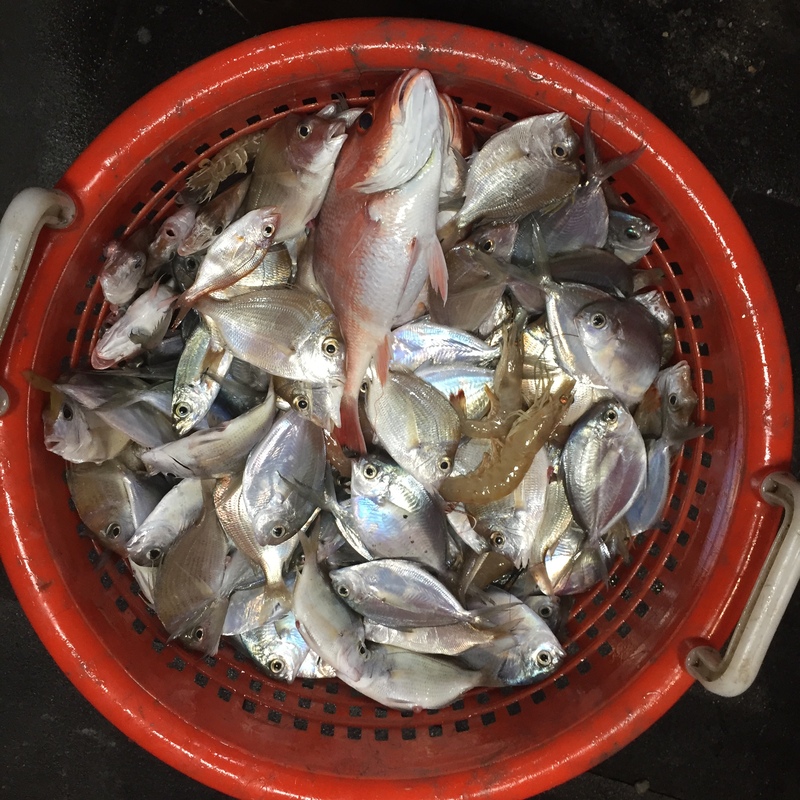 Thanks to hydrographic surveys, ships, ferries, pleasure boats, and other vessels can safely navigate in busy waters without hitting any obstructions on the bottom of a harbor. 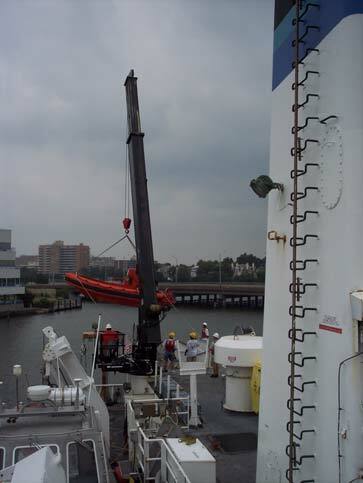 A crane lifts the necessary fast rescue boat aboard. 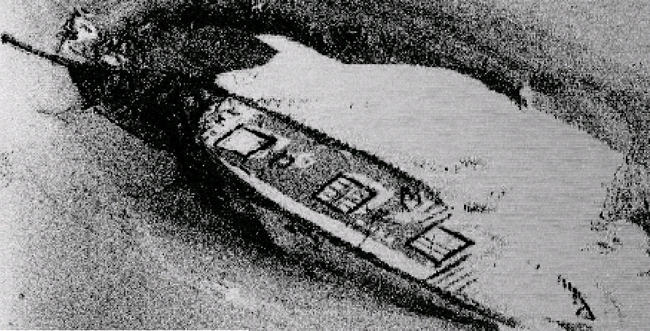 Hydrographic surveys can also locate submerged wrecks in deep waters; examples include unfortunate events such as shipwrecks out at sea as well as plane crashes over the ocean. 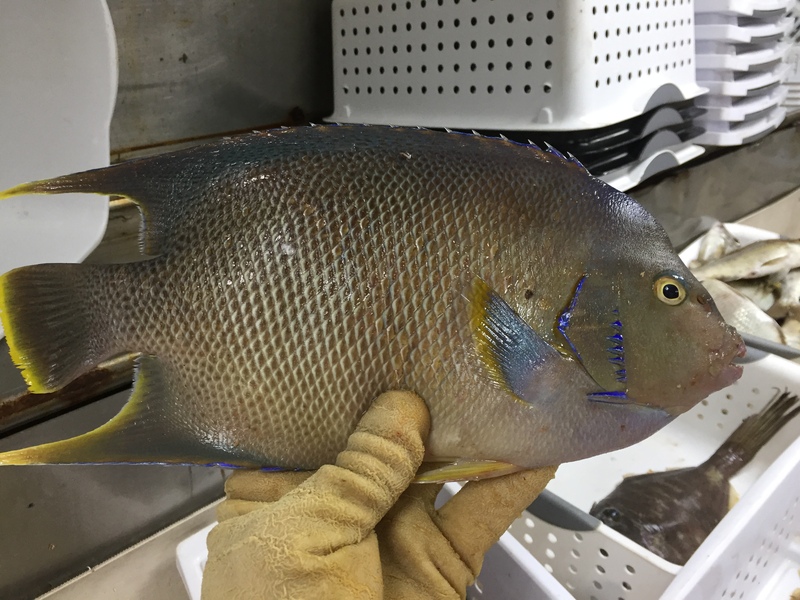 These surveys are done by using technology that involves side scan sonar and multi-beam sonar technology. The combination of these two types of technologies can create a clear picture of a barrier on the ocean floor and the depth of the obstruction. The THOMAS JEFFERSON holds several smaller boats including two launches (one launch is visible in the picture, it is the gray boat) that have this sonar technology located underneath the vessel. 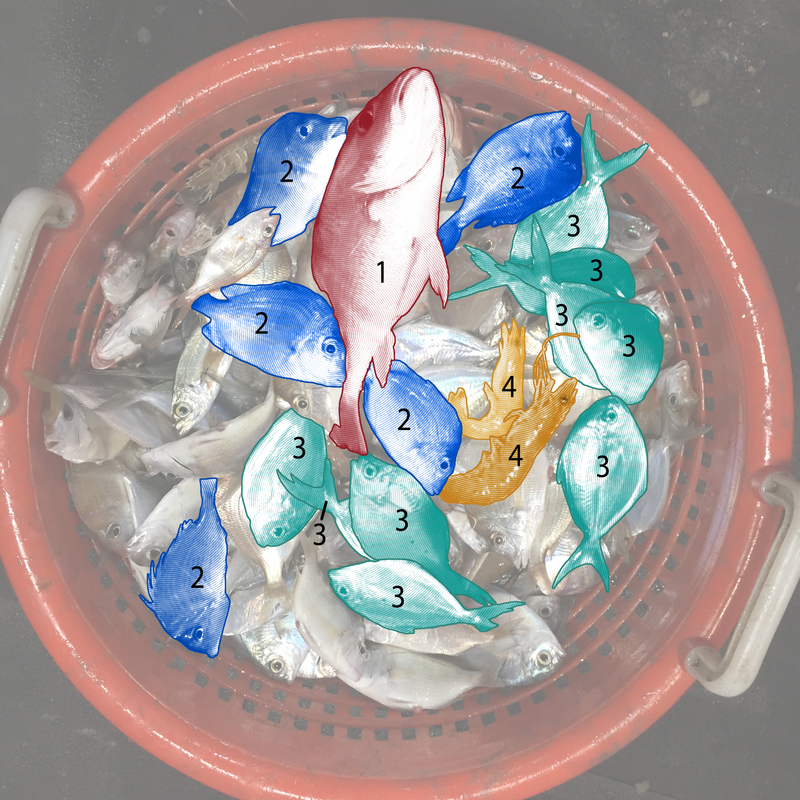 The instrument that collects data is often called a “fish.” The data can be seen on a computer screen so that the surveyors can view the data being collected. 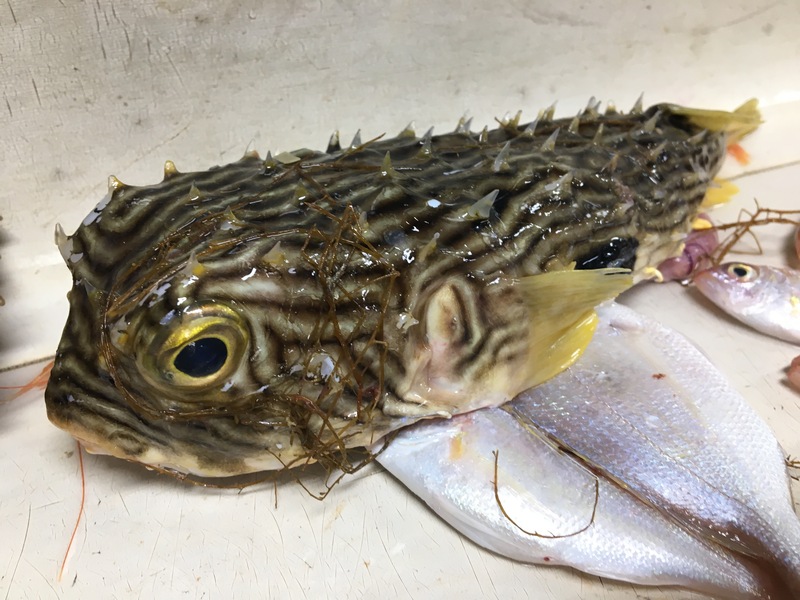 Once we reach our destination, we will use these launches, one equipped with a fish that uses multi-beam sonar technology and the other with a fish that uses side scan sonar to create a chart of what is on the bottom of a very busy harbor! 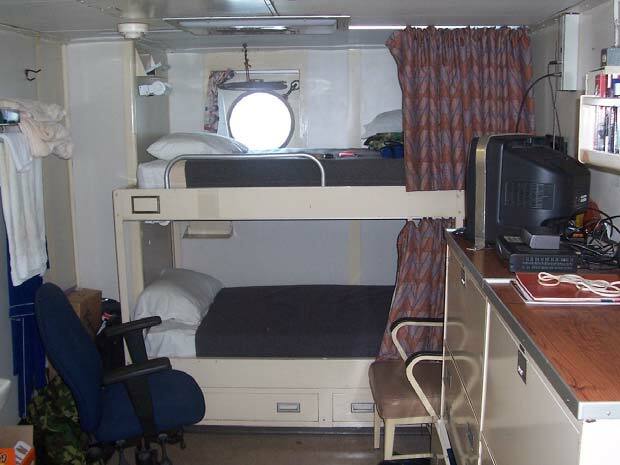 Staterooms are comfortable and cozy! 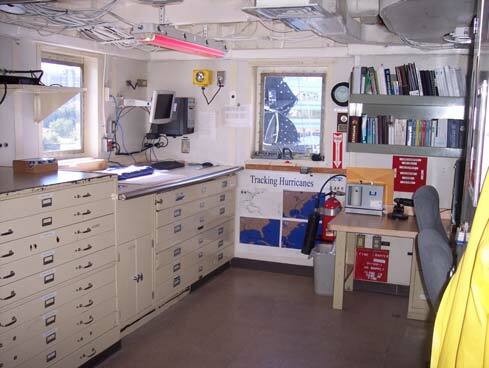 One of the workrooms aboard the NOAA Ship THOMAS JEFFERSON.